The Las Vegas Valley Water District (LVVWD) is one of the most respected water districts in the United States and has been for decades. This municipality has seen success and recognition for this success throughout their 60 years of existence. If you look at their "History" page on LVVWD's website, you'll see evidence of this. What's interesting about their elevated status is that they do many things differently than other water utilities. Their latest initiative we've learned about is that the district plans to move all of their remaining backflow preventers in vaults above ground. It is part of a larger overhaul of their backflow prevention devices. In all, the LVVWD plans to retrofit more than 11,000 backflows. The change has come about for a few key reasons. When asked what types of backflow devices are currently approved in the Las Vegas Valley Water district for each type of line, a representative stated that RPs are required for commercial, domestic and irrigation services while RPDAs are required on fire line services. This aligns with various parts of the country making a switch to require RPZs for the higher level of protection they provide. Currently, in the LVVWD service rules, it is stated that double check valves are allowed. However, a representative of LVVWD has said that of the 11,000 backflow devices being retrofitted, any double check detector assemblies and double check valve assemblies will be retrofitted. While not explicitly stated, it implies that double check valves will be changed to reduced pressure zone valves as that is what the representative said was required. This initiative is to be completed over the next 10 to 30 years. Las Vegas Valley Water District already leans more towards above ground solutions rather than vaults. Currently, it is estimated there are only a few hundred vaults with backflow preventers in the district. This is likely due to the same reasons given by the LVVWD representative for casting aside the remaining vaults. One point they made was that utility vaults deteriorate over the course of their life cycle and are prone to flooding. The district would prefer not to risk their employees going into a dangerous vault for testing or maintenance. Vaults are considered to be a confined space by OSHA standards and therefore pose a much higher risk than an aboveground enclosure. According to data collected by the U.S. Department of Labor (USDOL), Bureau of Labor Statistics (BLS) Census of Fatal Occupational Injuries (CFOI) program, fatal injuries in confined spaces fluctuated from a low of 81 in 1998 to a high of 100 in 2000 during the five-year period, averaging 92 fatalities per year. More than 4.8 million confined space entries are made each year. In addition to the deaths, 780 serious injuries are reported annually in confined spaces. You run into additional safety concerns if the vault is flooded. First, of course, a worker would need to drain the vault or risk encountering dangerous conditions inside the vault. Second, a flooded vault is a potential cross connection. We've written about this problem extensively, as has the USC Foundation for Cross Connection Control and Hydraulic Research. You can learn more about the dangers surrounding flooded vaults here. This comes back, once again, to the fact that flooded vaults pose a potential cross connection. It is the responsibility of the water municipality to ensure that no delivered water will ever be returned to the public water supply. This is laid out by the EPA in the Clean Water Act and their supporting Cross Connection Control Manual. Obviously, the Las Vegas Valley Water District takes their water utility management and this stipulation seriously. As each below grade vault reaches the end of its life cycle, LVVWD will install a backflow preventer above ground in its place. Keeping up with the state and federal standards seems to be more difficult when it comes to vaults than it does with above ground solutions. 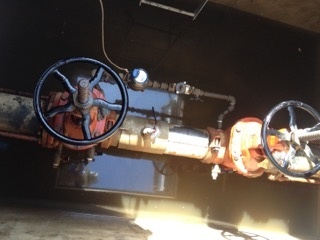 The district says it will be able to minimize financial impacts because their backflow devices should last longer outside of vaults and there will be less need for maintenance and repairs. This makes sense, as the device would no longer be subjected to flood water and the grime that comes with it. This comes from their "About" page on their website. The staff and leadership seem to have embraced this concept over the 60 years of the district's existence. It continues today with this new initiative to move backflow preventers out of vaults as well as requiring reduced pressure zone valves on all commercial, domestic, irrigation, and fire lines. If you're wondering how the district is paying for and maintaining public support for this project, we'll be covering those details in a future post on how the Las Vegas Valley Water District runs their water utility management and backflow program and why it works so well for them.